Welcome to my journey. I am pursuing LEED Professional Accreditation (LEED AP) to increase my sustainability knowledge base, to help guide my restoration of an historic opera house and to improve my chances of landing a green collar job after 20 years in high tech – despite an economy on life support and a sea of job seekers. Anyone interested in cleantech, efficiency, sustainability or the environment can benefit from formal LEED certification as it integrates these critical and frequently separate elements into a practical whole, and enables you to think more systematically about each as well. A LEED AP is generally recognized as an expert in the field of sustainable design and could add significant value to a “cleantech” career. And, perhaps that LEED certification may help you get that coveted green collar job. An acronym rarely heard outside the building community and hard-core energy enthusiasts before last year, LEED is increasingly bubbling up in conversations and job descriptions everywhere. The Leadership in Energy and Environmental Design (LEED) Green Building Rating System is the nationally accepted benchmark for the design, construction and operation of high performance green buildings, managed by the US Green Building Council (USGBC), a non-profit organization whose mission is to “transform the way buildings and communities are designed, built and operated, enabling an environmentally and socially responsible, healthy and prosperous environment that improves quality of life.” The LEED point-based scoring system includes programs for Certified, Silver, Gold and Platinum for new buildings, existing buildings, homes, schools and neighborhood development and ranges from a minimum of 26 to 69 points measured across the entire lifecycle of a facility, including site sustainability, water efficiency, energy & atmosphere, materials & resources and indoor environmental quality. It certainly makes sense to focus on sustainable facility design since buildings in the US are responsible for 72% of electricity consumption and 39% of CO2 emissions. Globally, buildings are the largest since source of CO2 emissions, followed by transportation then industry. 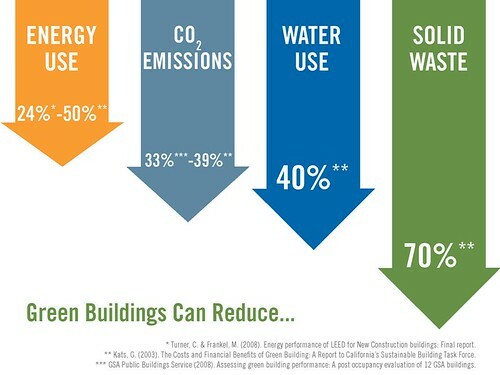 According to the USGBC, green buildings can reduce energy use by 24-50%, CO2 emissions by 33-39%, water use by 40% and solid waste 70% (source). Demand for LEED-certified buildings and professionals is booming due to unprecedented governmental initiatives, heightened residential demand and improvements in sustainable materials. While customers used to pay a hefty ‘LEED premium’, the incremental cost today is estimated at an extra 2% of construction costs and up to $150K in soft costs for Certified through Gold level certification. 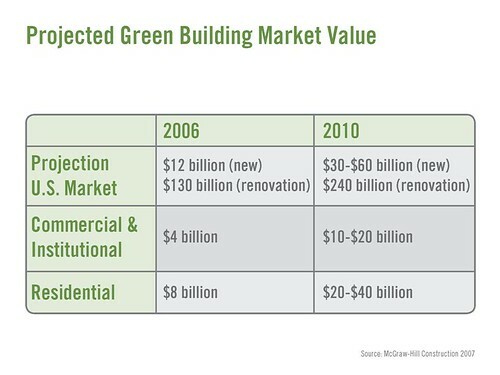 The projected green building market value is expected to grow rapidly from $12B in 2006 to $30-60B in 2010, requiring a serious injection of venture capital and green products and services delivered by a wide range of energy-smart and environmentally aware clean techies. Individuals can become LEED accredited by successfully taking the LEED Accredited Professional Exam, which enables an individual to facilitate the rating of buildings with the various LEED systems. Professional Accreditation is administered by the Green Building Certification Institute, which has partnered with Prometric to provide seminars and lectures to prepare candidates to take and pass the LEED AP Exam. The cost to take the exam is $300 for USGBC members and $400 for non-members, plus roughly $200 for a Reference Guide specific to a particular category. Optional, fee-based USGBC seminars are available from a variety of third party providers to help individuals prepare for the exam. USGBC membership, which ranges from $300 to several thousand depending on organizational size and type, is not a requirement for taking any of the exams that correspond to the various versions of the LEED system including New Buildings, Existing Building and Commercial Interiors. You can download sample test questions and review the LEED Accredited Professional Handbook for a better understanding of the process. The LEED AP exam consists of 80 questions, and is scored on a scale of 125 to 200, with a score of 170 required to pass. In future posts I’ll review each of the five categories of the Commercial Interiors Reference Guide at a high level, and hopefully put each into a broader context of specific cleantech solutions and overall market opportunities. I’d be interested in your comments – what is your job role that requires you to be LEED AP? For former Job Seekers did it help you land a CleanTech job? And almost more importantly, if you found it to be a waste of time, why did you think so? The Bull is Bullish on CleanTech… So? I’m a Project Manager(PM) for a general contractor who specializes in military projects, mainly for the US Navy. I am not an AP, but plan to take the test within the next two years. Naval Facilities(NAVFAC) Command has recently mandated a Self-Certified Silver LEED rating for a large majority of their new contracts and we have heard that by the end of 2009 they are going to require these projects to go a step further and register with the USGBC. As a PM, I have worked on one project that was a self-certified. We assembled all of the sample worksheets into a binder and submitted this to the government. Personally, I don’t think they have qualified personnel to review this information. I think this is why NAVFAC is planning to make all new contracts submit their project to the USGBC. In preparation for the future, we are voluntarily going to register our current project with the USBGC to learn about the process. We are shooting for a Gold rating, but will be satisfied with a Silver. Thus far, I have learned much more about each available point as our design team has developed our checklist. We have two APs in our office, but I don’t think that they know much more than I do at this point. They were accredited in 2004 and have only done self-certified projects so far. Getting a project through the USGBC is a much more difficult and time consuming process. I thought about taking the test, but I think I am going to wait until I have a few more projects under my belt. However, if you know the credits and have the LEED manual, I don’t see a huge benefit in taking the test. You don’t have to be an AP to register a project. As an employer, I would be much more interested in a candidate that has been a part of several USGBC submissions than a candidate with just an AP and no experience pushing a project through the USGBC. No matter if you decide to take the test or not, I think LEED is here to stay and anyone in the construction industry should be paying attention to LEED and how it is changing our industry. I am a LEED AP and I highly recommend taking the test sooner, rather than later. Leed 2009 will change much of the exam, so if anyone has been studying up and thinks they know the point system, they will all change next year when LEED 2009 is slated for adoption. LEED 2009 will weight more heavily on the environment and Life Cycle Analysis. I am interested in finding out more about this Opera House project. We are in the process of pursuing a similar course on a smaller scale. Hands-on experience certainly can be helpful prior to taking the LEED PA certification exam. I agree that LEED is here to stay, and growing increasingly important, imho. LEED PA certification’s usefulness is not strictly limited to the construction industry. By taking a holistic approach to sustainable facility design, LEED integrates resource management, environmental considerations and worker productivity — which can broaden one’s understanding each individual component such as energy efficiency, renewable energy, environmental issues, indoor air quality, transportation, carbon footprint, etc. One of the few bright spots in this dismal economy and job market is the prospect of green collar job growth. Many people looking for a job in this sector clearly won’t need LEED certification. However, assuming multiple candidates are relatively equally qualified for a given green collar position, the candidate having additional professional accreditation could get the interview over other candidates. So, while knowing the credits and having the reference guides is essential to successfully managing LEED-rated projects (internal or USGBC), achieving LEED PA certification also burnishes one’s green credentials in the increasingly-crowded marketplace — and can be especially critical in the initial candidate screening phase when your charm, wit and intelligence don’t yet have an opportunity to shine through. Yes, the changes from 2008 to 2009 are significant from what I understand, though the changes should affect relatively few individuals as going forward all reference and exam material will be 2009-based. The Newberry Theater is a 100-year old vaudeville-style theater with about 15K sf of attached commercial space over 3 floors. Building is classic Midwestern design – 2′ thick brick walls, plaster as insulation, 12′ ceilings, formerly radiant heat (now extinct)….The Newberry is currently open May-Nov as we lack heat, with a capacity of 99 until we add fire sprinklers (then 500 or so). Getting it to LEED Silver will be very difficult, but achieving LEED certification will pale in comparison to raising the $4M necessary for the renovation. At this point, LEED Silver is more of a design target than a current project. While I do not yet have a detailed LEED Silver renovation plan, I am increasingly confident that with a holistic approach to restoration this goal is attainable. From an energy perspective, I’m most interested in a CHP (e.g., sterling engine / fuel cell) or CCHP (building may be too small for combined heat, cooling and power) system. I also have a lot of flexibility in terms of how I design and implement theater space, commercial space or both (limited only by financing & cash flow). As en employee of the world’s largest commercial real estate firm, I can say that LEED and sustainability are a mega initiative for us. Both landlords and users benefit from LEED certified buildings and the savings that come from building green. Since my company also has Project Managers, engineers, and a facet that builds sky scrappers, people are literally making a killing on being LEED APs. In fact, the movement is so big that we’ve implemented a brokerage practice group that specializes in LEED projects. While some people are motivated by the opportunity to make money on LEED projects and sustainability while others recognize the win-win aspect of the green movement. Personally, I believe in constant learning and therefore for those of us in industries where becoming a LEED AP makes good business sense, I say go for it. The AP designation cements a candidate as creditable—provided that he or she has the EXPERIENCE to back up the credential. Trevor, Mike et al… I agree whole heartedly. Just look at Friday’s post on Project Frog – I can assure you that they are more interested in hiring experienced folks that will deliver. That is much more compelling than some alphabet soup behind an otherwise lack luster candidate. A lackluster candidate should never be seriously considered regardless of academic credentials. LEED AP certification can help an equally experienced candidate truly stand out, especially in a highly competitive job market. And the process of LEED PA certification can really broaden one’s perspective of most clean tech areas (RE, EE, environment, etc.). I know I think differently about ALL elements of the design and operation process now (and their inter-relation), and I’ve only finished studying the Site Selection module. Granted, someone focused on say algae-based bio-diesel may not think LEED certification is important – and they would likely be right if they stayed focused in that area. But once they understand the impact of holistic system design they may be able to identify new growth opportunities, and at a minimum, should be much more aware of the environmental impact of their product and operations. Since the market for LEED-certified professionals is growing relatively rapidly, individuals looking to make the switch from a purely tech-based background to the clean tech sector would do well to consider professional certification that demonstrates their understanding of key sustainability issues. It’s really no different than pursuing Cisco or MSFT certification to help make a career change during the dawn of the networking era. I passed my LEED AP on Sept 7, 2008 after laid off from my project manager job at a developing company in August. What I discover after networking and searching on the web is that most of the “working ” professionals are Architect/ LEED AP or Mechanical Engineer / LEED AP or Commissioning Engineer /LEED AP. I suppose if economy is good, the construction sector is strong, I could have marketed myself as Project Manager / LEED AP. But the timing is bad. I talked to a VP of commercial contractor, she herself is a LEED AP, and was promoting LEED in her company, but her firm is on a survival mode, so staying in business takes precedence over being green. Moreover, we need to follow the money, that is how business will respond. That’s why I think the energy portion of LEED makes business sense. But in terms of job and opportunity, focusing on the energy business does not mean you have to be a LEED AP. It is wise that you check around before you invest your time an money. Congratulations on passing your LEED AP exam, though you have my sympathy for being laid off. Many companies are in survival mode, to be sure, and no, you certainly don’t need to be a LEED AP to find a job in the energy business. However, at this point there is no other certification for sustainability expertise, and for some people, becoming a LEED AP will help them transition to a green collar job. The cost for the material is $200, the exam $400 and online access to practice tests $50, so the cost is not trivial but could be a very valuable investment if it helped land a new job. FYI, I just passed my LEED AP exam…and it was a BEAR! More in my next post, but it can be done and you will be better and wiser for the effort (and possibly even in a better career position as well). Congrats, George, it’s certainly not an easy test, but as you spell out in the post it’s definitely an important certification to get. One thing that helped me when doing my LEED training was to check out some of Everblue’s test prep materials. From practice tests to full-on courses, Everblue can certainly make this worthy chore less of a bear.